Tarik - A few months ago I made the following histogram of patent application pendency for US patent applications. The chart is discussed on my blog. Pendency Discussion on Patently-O. The basic answer is that the average pendency for an application is just over five years from the earliest priority filing and about 3 1/2 years if ignoring priority filings (such as provisional or parent applications). The USPTO reports an average pendency of 2.8 years by (1) ignoring priority claims and (2) counting the RCEs as new application filings. 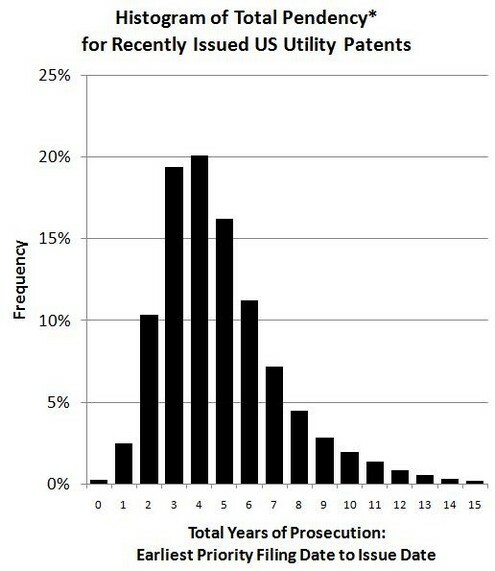 As the chart shows below, there is a large amount of variance and so it quite likely that any particular patent's pendency is far from the average. Not the answer you're looking for? Browse other questions tagged usa filing us7445677 or ask your own question. What is differences between us8216392 and us7445677?